Tsunami inundation mapping is the first step in the development of effective evacuation plans for communities at risk. These maps also provide a bases for land use planners in communities to reduce risk by locating critical facilities including schools, out of the potential tsunami flood plain. The first comprehensive inundation mapping in the Cascadia Region began in the Cascadia Region after the creation of the Natonal Tsunami Hazard Mitigation Program (NTHMP). The NTHMP was formed in 1995 by Congressional action which directed the National Oceanic and Atmospheric Administration (NOAA) to form and lead a Federal/State working group. The Congressional action was the result of recognition in 1990 of the tsunami threat to Oregon, Washington, and northern California from a magnitude 9 earthquake on the Cascadia subduction zone, the April 1992 earthquake and tsunami on the Cascadia subduction zone in northern California, and the loss of life and property in Japan due to the 1994 Hokkaido, Japan earthquake and tsunami. These events, together with the historic Alaska tsunamis of 1946 and 1964, brought to light the general lack of tsunami preparedness and hazard assessment for the U.S. west coast and the need for significant improvement in tsunami detection and forecasting. The NTHMP is a partnership between NOAA, the United States Geological Survey (USGS), the Federal Emergency Management Agency (FEMA), the National Science Foundation (NSF), and the 28 U.S. Coastal States Territories, and Commonwealths. 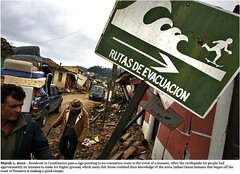 On February 27th 2010 a magnitude 8.8 "mega thrust" or subduction zone earthquake occurred off the central coast of Chile generating a Tsunami that claimed hundreds of lives. 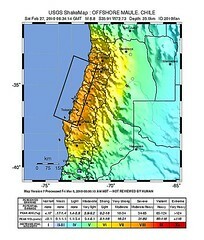 The maximum amplitude of the tsunami waves generate was recorded in Pichilemu, Chile at 3 meters or about 10 feet. A tsunami advisory was issued by the West Coast Tsunami Warning Center in Palmer Alaska for the West Coast of the Continental US and British Columbia did the same. Though no significant tsunami wave arrived on the west coast , and Hawaii experienced smaller waver than predicted (2-3 feet vs. original estimate of ~ 10 feet), residents of the Cascadia Region were reminded that a locally generated tsunami will be a major threat to coastal residents. In Chile, the experience of the 1960 great M9.6 earthquake and tsunami left people aware of the destructive power of tsunami waves. 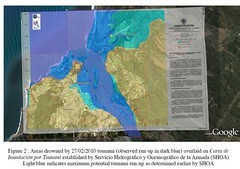 In coastal urban areas tsunami hazard maps were developed and evacuation plans made. This planning saved lives following the great 2010 earthquake as many people evacuated hazard zones successfully. All the inundated areas of Conception were mapped as tsunami hazard zones though not all of the hazard zone was flooded due to the moderate size of the tsunami generated. The Tohuku Japan M 9.1 earthquake on Friday, March 11th, 2011 provided horrifying images to the world of great waves smashing through the best coastal defences in the world and into the heart of coastal cities. The tsunami in Miyako swirled over the top of thre story buildings designated as safe for vertical evacuation. Maximum wave height in Miyako was reported as reaching 40.5 meters or 133 feet. 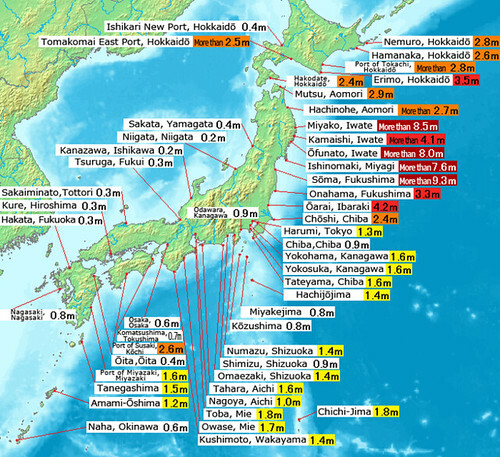 The flooded Fukashima nuclear power plant lost its primary and secondary power systems that lead to the possibly the worst nuclear catastophy since World War II. Japanese scientists made a serious mistake in thinking that a few hundred years of history defined the limit of how large earthquakes in the Japan Trench subduction zone could get. The consensus reached was less than M8.5, the "Great East Japan Earthquake" is estimated to have been a Ms 9.1. Evidence of a large tsunami in the year 869 C.E. had not yet been incorporated into the hazard assesments.